Ten international activists and six Korean activists were arrested today, February 26, after crawling under the razor wire at the Navy base on Jeju Island. Global Network members were among those arrested, including Bruce Gagnon, Mary Beth Sullivan, Dave Webb, Natasha Mayers, Agneta Norberg, Gun-Brit Makitalo, Angie Zelter and Dennis Apel. 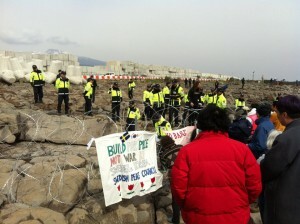 More than 70 activists used kayaks to get onto the rocky coast where they held a Catholic mass, sang songs, ate food, made speeches, and then moved under the the wire fence to enter the base destruction area.Five of those arrested were moved to Dongbu police station in Jeju City. Today’s candlelight vigil was held in front of Seogwipo police station where the other 11 were being held. The police arrested 20 more people during the vigil at the police station claiming it was an illegal protest.After some hassles by the authorities many of the activists were released from jail by about 11:00 pm.